I recently walked miles through what could have easily been mistaken for a shopping mall to reach my boarding gate. Boutiques lined my route through Rome’s Fiumicino airport, but not just the standard airport duty-free outlets. Instead, high-end emporiums such as Gucci and Hermes, interspersed with high street brands United Colors of Benetton and Calzedonia tried to distract me into spending my remaining euros. According to the creators of the Best Airport Shopping Awards, London Heathrow offers the best airport shopping experience. Rome Fiumicino amazingly only makes 8th of the list. At No.3 Hong Kong, another immense airport I have visited recently offers a multitude of retail opportunities. Although the sense of being in a shopping mall is lessened by the open spaces and high glass ceilings. Closer to home Amsterdam (No.5), Paris CDG (No.9) and Frankfurt (No.10) are amongst Europe’s best airport malls. Schiphol boasts that it never sleeps. 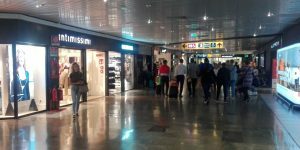 The airport shopping experience here can begin 90 minutes before the first flight of the day and closes 30 minutes before the last flight departs. Airport shopping at Heathrow is big business and offers a rewards programme for frequent visitors. Points can be earned for every £1 spent on food, parking, currency purchases, lounges, hotels etc. Points can also be converted into Heathrow reward points from other larger travel reward schemes. When you are travelling within the UK or EU, Heathrow also offers a free Shop & Collect service. With an on-site Personal Shopper available to help provide fashion and purchasing tips in the terminals. These services, which are also available in Rome, cover all of the fifty plus brand outlets in both airports. Which means you can spend to your heart’s content, with dedicated advice, then pick up your goodies in the arrivals area when you return home. Heathrow has also gone one step further. If you have signed up to their reward scheme, you can also take advantage of their home delivery service. Spend over £300, and there is the facility to have your pre-boarding acquisitions delivered to any UK mainland residential address free of charge. It is undoubtedly this catalogue of extra service which holds Heathrow at the top of the rankings as the worlds best airport shopping mall.